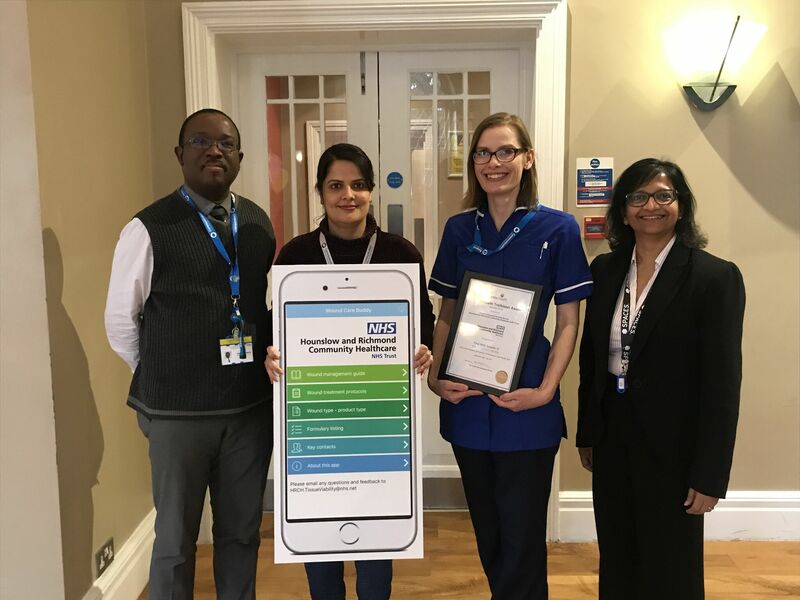 The Journal of Community Nursing (JCN) has announced Hounslow & Richmond Community Healthcare NHS Trust (HRCH) as winners in Outstanding Practice in Wound Care for successful implementation of the Wound Care Buddy App for their district nurses. This follows a successful collaboration between HRCH and Entec Health Limited, the company behind the Wound Care Buddy App. The Wound Care Buddy App enables healthcare professionals to access their organisation’s wound management guidelines and formulary product listing, on mobile devices at the point of care, to support standardised care and best practice. Hounslow & Richmond Community Healthcare NHS Trust has become the first organisation in the NHS to adopt the Wound Care Buddy App as a part of their commitment to enabling their nurses to deliver the best patient care possible. The Wound Care Buddy App has been very well received at the Trust. There has been positive impact for the Tissue Viability Nursing (TVN) team and District Nurses, helping staff to access essential information rapidly when needed and to use their time more effectively. Previously, if district nurses required specialist information at the point of care, they would have to contact a Tissue Viability Nurse (TVN) over the phone, which proved to be an ineffective method, as in some cases the TVN nurses may have called back after district nurses had left the patient's home. "The TVN team is now receiving fewer calls about basic wound care advice as district nurses can find the information when needed"
The team at HRCH are extremely passionate about digital health care and are continuously seeking innovative systems to support their tissue viability service and district nurses in delivering the best care possible.This prestigious JCN Award for Hounslow & Richmond Community Healthcare NHS Trust recognises the Trust’s ability to innovate how their staff deliver excellence in wound care.The HRCH management team has also found the anonymised analytics generated by the Wound Care Buddy App very useful in tracking uptake of the App and user visits per screen. This has given HRCH invaluable insights on the information that their district nurses are seeking out to support patient care. "Analytics such as users per month and screen views is helping us understand what information is regularly being accessed and demonstrating active use of the Trust's Wound Management Formulary"